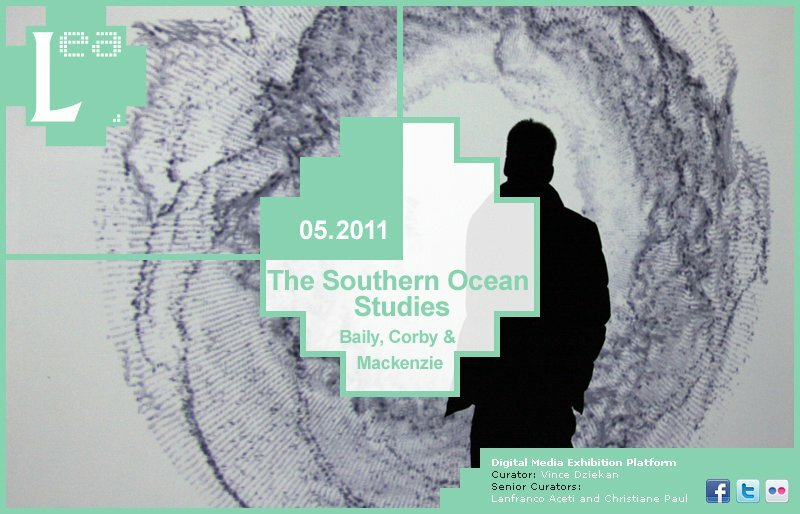 During the month of May, LEA’s digital media exhibition platform will present ‘The Southern Ocean Studies’ by Baily, Corby & Mackenzie. In late 2009, Gavin Baily, Tom Corby and Jonathan Mackenzie began a collaborative project with the British Antarctic Survey to explore how climate data and models could be used to develop different ways of representing environmental change. As artists whose practice explores the mapping and visualization of phenomena their interest was focused upon both the materiality of climate change and the structures and processes of scientific knowledge that produce understanding of it (data collection, modelling, outputs etc.). Soon after beginning this work the email server at Climatic Research Unit at the University of East Anglia was hacked and it became clear that the data of climate change had become a cultural actor within the discourses of environmental change in its own right. This politicization of climate data whilst potentially dangerous reinforced their original intuition that this material had a public life outside the labs. This online exhibition maps some of the research process and work that is being produced as part of the collaboration with the British Antarctic Survey; work will include code sketches, visual developments and documentation of finished projects. Corby, Baily and Mackenzie have been working together for over 15 years, through an art practice that explores the intersections of complex systems, technology and information. Their work has been reviewed in Art Review, Art Monthly, The Guardian, La Republicca and El Pais, and exhibitions include at Zentrum fur Kunst und Medientechnologie (ZKM); Institute of Contemporary Arts (ICA), London; the Intercommunication Centre (ICC), Tokyo, the Victoria and Albert Museum amongst many others. Their research has received funding from the British Council, Arts Council England, the Arts & Humanities Research Council and the Wellcome Trust. Leonardo is a registered trademark of the ISAST.